When the cherry blossoms and dogwoods bloom in the springtime on Long Island, NY the opportunities for beautiful wedding pictures abound. 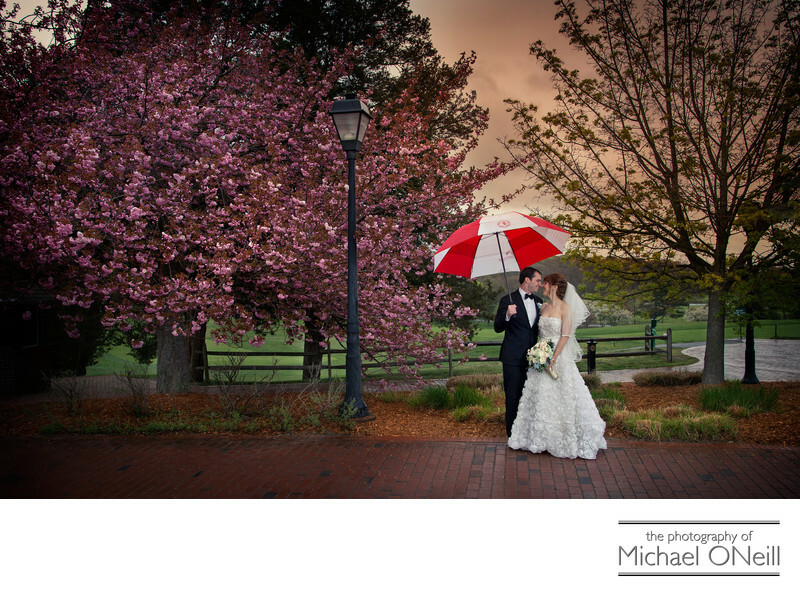 This lovely couple had specifically requested a photograph by this flowering cherry blossom tree at their wedding celebration venue, Carlyle on the Green at Bethpage State Park. Unfortunately Mother Nature did not get the memo and chose to spend the entire day unleashing a torrent of rain, gusty winds and temperatures hovering around forty degrees. Not to be denied they grabbed a golf umbrella and headed out to this spot which overlooks the legendary Black Course...two time home of the US Open Golf Tournament. Carlyle on the Green is one of the most elegant wedding reception venues anywhere. Many of my bridal clients travel out from New York City NYC to host their upscale events here. The views from the Grand Conservatory ballroom are breathtaking as you look out over the sprawling hills and valleys that make up the five 18 hole golf courses on the property. The interior rivals the finest of Long Island’s Gold Coast Mansions with understated elegance, opulent furnishings and the finest amenities. Service is first class and the cuisine is truly special. If you are planning a wedding at Carlyle on the Green and are looking for a photographer with years of experience creating fine wedding photographs there, give me a call. My East Northport, New York studio is located just 15 minutes away from this wonderful place.